Multi award-winning Wayne McGregor choreographs this striking new dance show. Lurching through extreme sonic worlds specially created by Warp Records artists including Clark, Gaika, Mark Pritchard and Lorenzo Senni, super-human dancers from Company Wayne McGregor and The Royal Ballet will perform within the +/- Human installation. 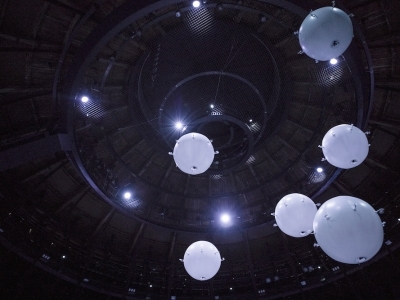 Their movement will converge with autonomous flying spheres in an immersive choreographic performance. All performances are standing only and audience members can move around the space. For access tickets please contact us. The show 7pm Saturday 12 August will be 15 mins longer and will include young performers from Roundhouse and Studio Wayne McGregor’s Creative Project. +/- Human is an immersive installation that plays host to an incredible live dance performance. +/- Human is brought to you by Bloomberg Summer at the Roundhouse, an annual season dedicated to introducing new audiences to innovative culture. Commissioned by the Roundhouse, with support from THE ROYAL BALLET, +/- Human is curated by WAYNE McGREGOR, Zoological art installation by RANDOM INTERNATIONAL, lighting by LUCY CARTER, sound by MARK PRITCHARD, dance performances choreographed by WAYNE McGREGOR and performed by COMPANY WAYNE McGREGOR and dancers from THE ROYAL BALLET, music by WARP RECORDS. Discover the people, ideas and inspiration behind our new installation with this handy guide. This performance is standing. For access seats or wheelchair spaces please contact us. Standard tickets sold at £15 will increase to £17.50 on the door.